This page will guide you through Ultimate Skyrim’s final procedures. You’re almost there! Make sure to read all instructions carefully. If you’re unsure about any part of the guide, feel free to ask the Community for support. The default Skyrim files (also known as “Masters”) contain some errors that TES5Edit will help us clean. 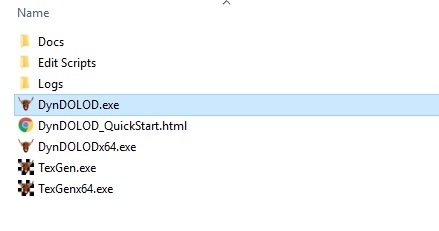 Open the folder where you installed Ultimate Skyrim and run ModOrganizer.exe. Click here for a video tutorial on cleaning Masters with TES5Edit, courtesy of the excellent GamerPoets channel. Michael is using SSEEdit in this video, but the steps are identical for TES5Edit - just imagine he’s saying “TES5Edit” every time he mentions “SSEdit” or “xEdit”. Using the video tutorial, clean the files Update.esm, Dawnguard.esm, HearthFires.esm, and Dragonborn.esm. When the video reaches 9:05, you can exit. Make sure to drop Michael a like for his help, and consider subscribing if you liked the video. Ultimate Skyrim has its own .ini presets that will optimize your game and adjust important settings. Click here to to download the Ultimate Skyrim .ini Files. 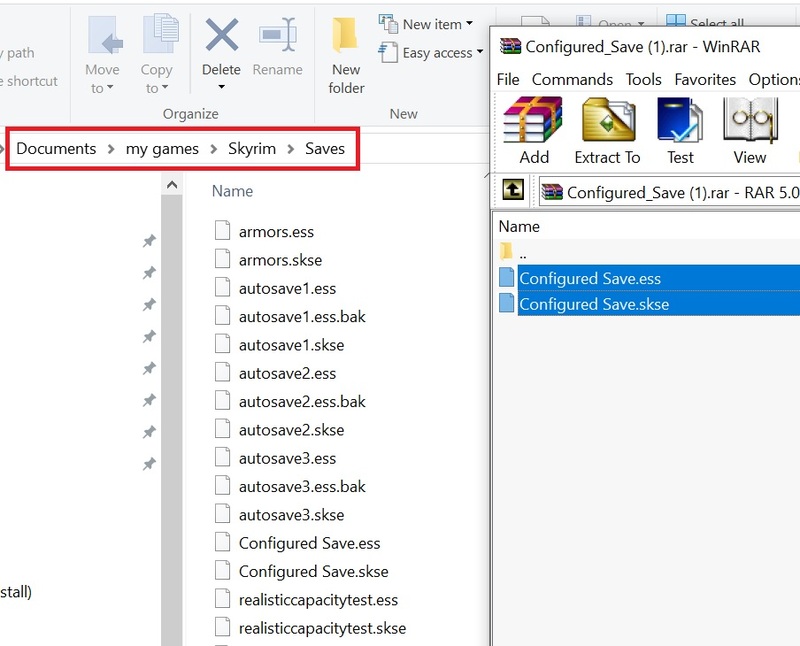 Once you’ve selected a preset, drag and drop skyrim.ini & skyrimprefs.ini into your Ultimate Skyrim profile. If you ever want to switch .ini’s, simply repeat this process with the new .ini files. FNIS (Fore’s New Idles for Skyrim) is a utility that allows mods to utilize new animations. It’s already installed on your machine, and we’re going to run it now. 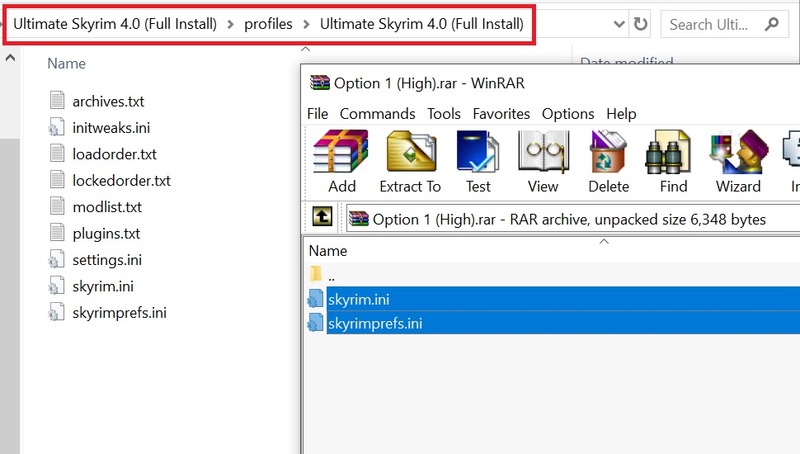 Click here for a video tutorial on installing FNIS that I created for older versions of Ultimate Skyrim. The information is still correct, though your Mod Organizer folder will be wherever you installed Ultimate Skyrim. Close the video once FNIS installation is complete. Do not continue past FNIS installation. Automatic Variants is an optional mod that creates visual variety for certain animals, monsters, etc. There’s little to no performance impact, and I highly recommend it. Click here for a video tutorial on installing Automatic Variants that I created for older versions of Ultimate Skyrim. 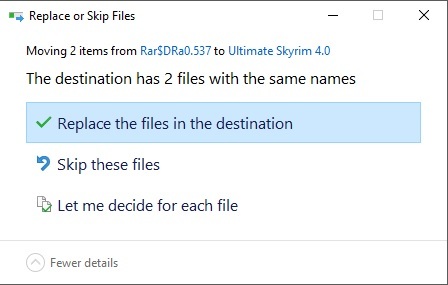 Like with FNIS, the information is still correct, though your Mod Organizer folder will be wherever you installed Ultimate Skyrim. Close the video once Automatic Variants installation is complete. Do not continue past Automatic Variants installation. DynDOLOD is an optional mod that greatly improves the appearance of distant terrain. It can affect your framerate, but the impact isn’t too bad & I think the visual difference is well worth it. Copy the downloaded files to a location of your choosing - preferably the same drive as your Skyrim install. 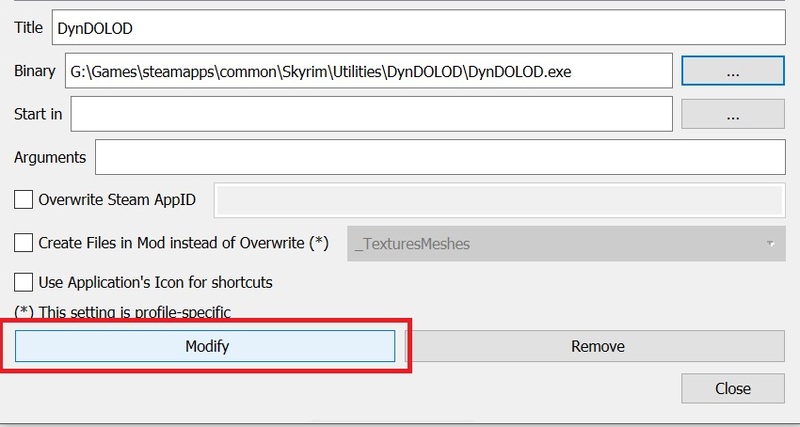 Click the “Modify Executables” button, enter “DynDOLOD” as the Title, and then click the ellipses next to the “Binary” field. 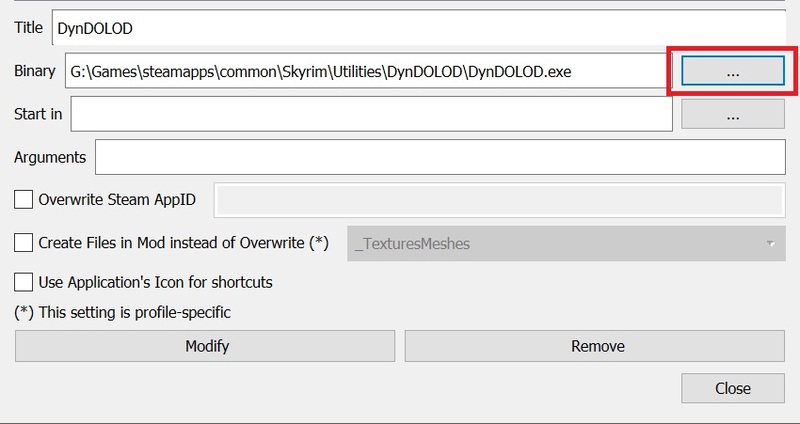 Navigate to where you placed the DynDOLOD files, select DynDOLOD.exe, and then click “Add/Modify” to finalize the executable. Your button may show “Add” or "Modify” - either is fine. Click here for a video tutorial on running DynDOLOD that I created for older versions of Ultimate Skyrim. The information is still generally correct and any slight differences are not a problem, except that you should not disable DynDOLOD.esp as the video instructs. That is an outdated instruction. Close the video once DynDOLOD installation is complete. Do not continue past DynDOLOD installation. The Requiem Patcher (also known as the Reqtificator) ensures that everything in your install is balanced for Requiem. When the patcher notifies you about having over 100 plugins, select “Ignore from now on”. You can leave everything default for Step 7. Snowfall ENB is Ultimate Skyrim’s recommended ENB preset, which greatly enhances lighting, weathers, and graphics across the board. It’s totally optional, but highly recommended. Navigate to the Mods folder within your Mod Organizer folder, as you did with FNIS & Automatic Variants. 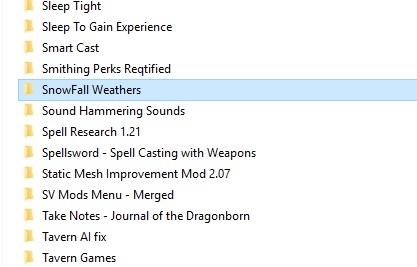 Open the Snowfall Weathers folder, and within that, open the folder “ENB Files - empty into Skyrim Directory”. Click here to download our custom ENB files, and copy those into your Skyrim folder as well. These files should replace/overwrite existing files. Congratulations - it’s finally time to start the game! However, some mods require in-game configuration through the Mod Configuration Menu. Click here for the MCM guide. It contains everything you’ll need to configure your MCM’s for Ultimate Skyrim. and load the save titled “Configured Save” once you launch the game. Whether or not you’re using a template save, make sure to read the MCM guide. It contains important information for all users. Pat yourself on the back, buckaroo - you’ve done it! Ultimate Skyrim is fully installed, and you are ready to play. Thanks for your patience, and we hope you enjoy your time in Tamriel! Don’t forget to check out the Ultimate Skyrim Community page, and if you’re feeling generous, visit the Support page for some ideas on contributing to the larger modding community.